After a long hard week, this is just what I needed… Friday night cocktails at home. This little concoction is my own recipe and that’s Tajin on the rim. Don’t know about Tajin? Its this great salty, spicy, sweet, tangy powder that many of us Mexicans down here in Tucson put on fruit, jicama, candy and just about whatever we want. It is absolutely delicious on the rim of my citrus margarita here instead of salt. 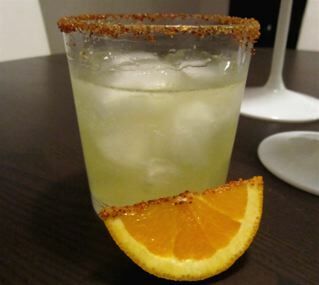 I used my favorite tequila for this one, Milagro and fresh orange and lemon juice. It’s refreshing and has a great kick that mellows me right out. Today was the last day of the quarter for me at work and I was pushing hard and long today to get everything in on time. When I was done and realized that I had accomplished just what I set out to do, emptied out my inbox, and left the day with an organized desk, I knew I had to show myself some love for the hard work. This one hit the spot. Moral of the story: celebrate even the littlest victories of your day. You might be the only one who recognizes them, so guess what? that means you are in charge of celebrating them. Show yourself some love today and do something that you really enjoy. For me, tonight, that is making a delicious cocktail at home and curling up with my hubby, kids, and the dogs. What do you really enjoy?